'Woman flaunting taut body.' What's wrong with newspaper headlines. Last night I stumbled upon this diabolically ludicrous headline about Kylie Minogue. 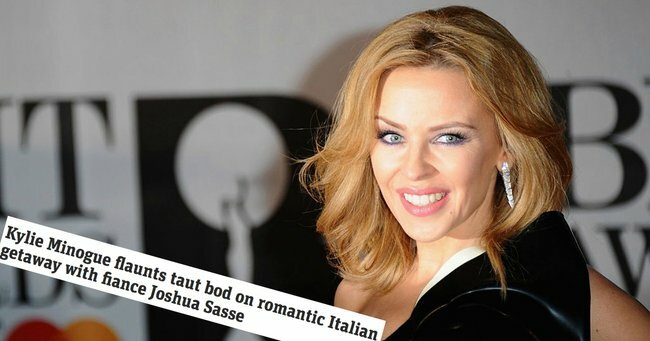 Kylie Minogue flaunts taut bod on romantic Italian getaway with fiance Joshua Sasse. I read that and my head fell off. Because FLAUNTING HER TAUT BODY? ARE YOU KIDDING ME? Kylie Minogue is on a private holiday and she’s wearing one of the most modest swimsuits in the history of humankind. On top of that the photo has clearly been taken by paparazzi wielding a LONG LENS CAMERA. And you’re telling us Kylie is FLAUNTING HERSELF? But that headline and the blatant misuse of the word flaunt makes me think perhaps none of you know what flaunt actually means. Ahhh, but then that headline has nothing to do with what Minogue is wearing. You and I both know that. Because – newspaper headline writers – I have seen you throw that word FLAUNT around regardless of what a woman is wearing. When the Duchess of Cambridge left the house for the first time after having Princess Charlotte you told us she was ‘flaunting her post-baby bod’. Was she though? Was she? Or was the Duchess in fact LEAVING THE HOUSE WITH CLOTHES ON? Is she flaunting her curves? Or is she once again just, you know, EXISTING AS A HUMAN BEING? That’s right! The answer is YOU ARE A MORON AND THE PERSON IS EXISTING AS A HUMAN BEING. By your reckoning just a woman breathing and being out in public is her flaunting herself. So that means last night when I went into the garden at 10pm looking for my four-year-old’s missing lunchbox lid wearing a dressing gown and pink ugg boots, I was flaunting myself. Right now I’m brazenly flaunting myself by heading to Woolies wearing jeans and a t-shirt. Your mother warned you about girls like me. Amirite? Newspaper Headline Writers, I think it’s time to delete the word flaunt from your vocab since you’re unsure how to use it. Watch the trailer for Embrace, a documentary about body image and how we’re going to change the future for women and girls.